a.forte's blog of Spain Hill Farm: Nashville Country Living Fair 2016 and a Giveaway!! 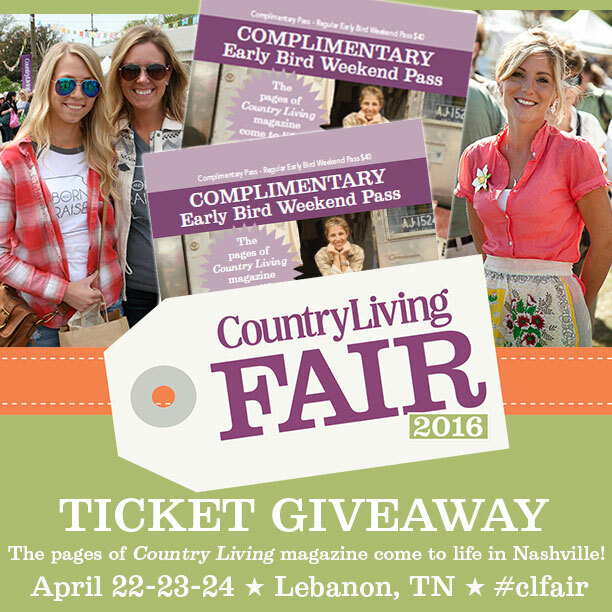 Nashville Country Living Fair 2016 and a Giveaway!! 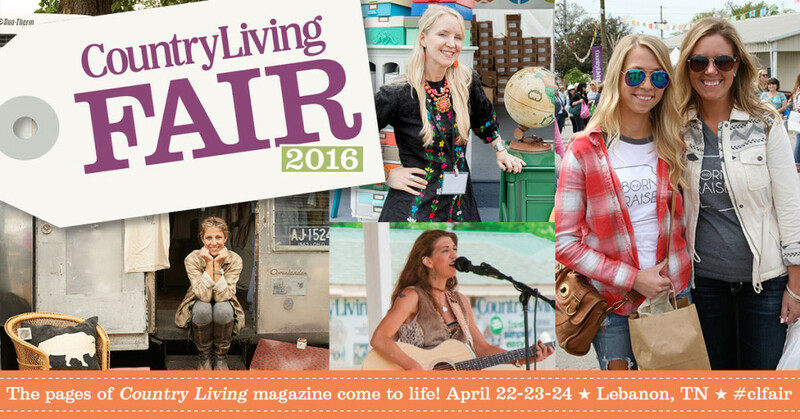 NEW YORK (February 29, 2016) – Country Living magazine announced today that the annual Country Living Fair will return to Nashville, taking place on April 22-24, 2016 at the James E. Ward Agricultural Center in Lebanon. The Fair is expected to draw more than 20,000 visitors from across the country. The Country Living Fair brings the magazine’s content to life and gives readers access to a unique shopping experience featuring more than 200 vendors from 25 states, including antiques sellers, food purveyors, artists, furniture makers, crafters, and more. Guests will also have a chance to meet Country Living editors and their special guests, attend cooking, crafting, and DIY demonstrations, book signings, sample locally sourced, artisanal food, and shop the Country Living General Store. "We’re thrilled to be back in Nashville kicking off the Country Living Fair’s 2016 season,” said editor-in-chief Rachel Hardage Barrett. Featured vendors include: Farmhouse Frocks (beautiful upcycled clothing), Grandmother’s Buttons (antique button jewelry), FOUNT (handmade leather goods), JBS Mercantile (unique crafting kits), Mary Gregory Studio (country life oil paintings), Raw Materials Vintage (vintage linens and textiles), Scarlett Scales Antiques (Franklin, TN, antiques shop), and South Porch Antiques (antique and vintage designs). The 2016 Country Living Fair in Nashville is sponsored by The 2016 Ford Experience Tour, Go RVing and Petfinder and is produced by Stella Show Management Company. For tickets and additional information, including a list of vendors and discounted hotel rates, contact Stella Show Management Co. at 1-866-500-FAIR or www.stellashows.com. For additional details, visit www.countryliving.com/fair. Attendees will be able to engage with Country Living at the Fairs by using the hashtag #CLFair and share their favorite finds using the hashtag #CLFairFinds. · Free admission for children ages 16 and under. Hours: Friday, Saturday & Sunday 10 a.m. to 5 p.m.; gates open for Early Birds at 8:30 a.m. Friday & Saturday. Location: Held rain or shine outdoors under tents, the Fair takes place at the James E. Ward Agricultural Center, 945 East Baddour Parkway in Lebanon, TN. Parking is free and plentiful. TWO EARLY BIRD WEEKEND PASSES TO GIVEAWAY!!! To enter, simply leave me a comment stating who you would take with you?! One lucky winner will be chosen on April 12th at 9:00 p.m. Make sure you enter your email when commenting so I'll have a way to contact you!! See you at the Country Living Fair! !